Undergraduates get exclusive look inside cosmetics giant as part of the Magner Career Center program at Brooklyn College. Executive Director Human Resources at Estée Lauder Irene Waxman '70 offers valuable advice to Brooklyn College undergraduates during a company visit on June 13. The group of Brooklyn College undergraduates met this past June at a 50-story building just off Central Park at East 59th Street. They were ushered into an elevator and led to a spacious conference room on the 43rd floor at the headquarters of international cosmetics giant Estée Lauder. There they were greeted by Human Resources Associate Amy Linda, who gave a brief history of the company, and Brooklyn College alumna Irene Waxman '70, executive director of human resources, and the person who made the visit possible. As the students enjoyed breakfast, executives from various departments — first Waxman, and then colleagues from Estée Lauder's marketing, human resources, packaging, and accounting and finance departments — dropped by and spoke to the students. They outlined their roles at the company and the function of their departments, showed samples of their work, offered advice and encouragement, and fielded questions about what it was like to work at one of the world's leading manufacturers and marketers of quality cosmetics and fragrance, with net sales of $9.7 billion and net earnings of $856.9 million in 2012. At the end of the presentation, the students took a tour, including a stop at the office of Estée Lauder, kept as it was when the company's founder was alive. Students left with gift bags full of Estée Lauder products, and more importantly, with an invaluable experience. 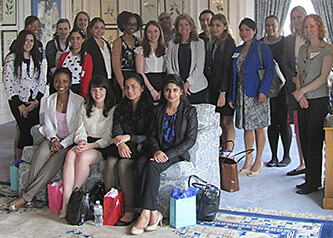 Irene Waxman ’70 (second row, center), executive director of human resources at Estée Lauder, gathers with Brooklyn College students at company headquarters. Human Resources Associate Amy Linda stands second row, third from left, and Suzanne Grossman, career education and training coordinator at the Magner Career Center, stands second row, far right. This is the goal of the Company Visits program, to provide an exclusive look at the inner workings of wide-ranging companies. Created by the Magner Career Center at Brooklyn College, the program gives students a chance to interact with employers in a professional setting, gaining a deeper knowledge of a company's core business and mission, and insights into new worlds of career opportunities. "The program offers a unique opportunity for students to see inside a company and start to imagine what it might be like to work there," says Suzanne Grossman, career education and training coordinator at the Magner Career Center who currently runs the Company Visits program and organized the Estée Lauder visit. "Because the groups are often small, students are given a chance to have a more intimate discussion with professionals and alumni. Students walk away with invaluable career advice directly from company and industry insiders," says Natalia Guarin-Klein, associate director for internships and alumni programs at the Magner Career Center who founded the Company Visits program in 2007. Equally important to undergraduates is advice on charting a career path and speaking to successful professionals about what it takes to make it in his or her field. "Being able to interact with professionals, receive career advice, and learn about a company from an insider's perspective was a valuable experience," says undergraduate Anastasia Naderiants '14, a double major in mathematics and communications. "The company visit fleshed out the oftentimes bare bones of job descriptions," says international business major Shani Abraham '14. "Being able to learn about a job or position through a tangible experience such as a company visit is such a huge asset, and you are able to observe things that you might not be able to on traditional online and in print medium resources." "Our students really distinguished themselves by asking excellent questions," says Grossman, who accompanies the undergraduates on visits. The students were prepared to meet and network with Waxman and her colleagues thanks to the Building Professional Relationships workshop, a prerequisite to corporate visits offered by the Magner Career Center that outlines the importance of professional relationships, the networking tool LinkedIn, the alumni mentor program, and how to build a network. Although the focus of Company Visits is to help undergraduate students while they consider their future careers, there is another benefit in the participation of alumni. "I am so appreciative of the quality education and values that I received at Brooklyn College and know that my time there served as a foundation for success in my career," says Waxman, who over the last few years has focused her attention on helping to shape the diversity and inclusion strategies for her company. "I am very pleased to get reacquainted with Brooklyn College today, and look forward to being a resource and mentor to current and future students." "We welcome the opportunity to work with alumni and donors, they are a big constituency for the College," says Lidy Chu, associate director, corporate and private foundation relations at Brooklyn College. "Irene came to Magner on a panel called Secrets of Highly Successful Women in fall 2012. Since she became involved with us we received a donation from Estée Lauder for our Brooklyn College Night gala in May 2013, and she coordinated the Company Visit. She has been incredibly generous from start to finish." Says Waxman, "After my recent visit to the campus, which gave me the opportunity to meet with staff and students, I feel confident that the college's strong heritage is serving as a springboard for the innovative initiatives that are being created to advance student's professional opportunities. Brooklyn College is not just alive and well – it is thriving!" The Magner Career Center, under the direction of Dr. Robert Oliva, assists Brooklyn College students and alumni in developing the skills necessary to reach their career goals through partnerships with employers, and the college's academic faculty and staff. Company Visits are by invitation only per faculty or staff nominations and require attendance at the Building Professional Relationships Workshop prior to the visit. Past visits have included such diverse companies and organizations as Google, MTV, the Food Network, the United Nations, the American Diabetes Association, American Association of Publishers, Bloomberg, New York City Government agencies, Penguin Group, Goldman Sachs, Madison Square Garden, and the accounting firm PricewaterhouseCoopers. For more information on upcoming Company Visits during the 2013-14 academic year, please email Suzanne Grossman at suzanneg@brooklyn.cuny.edu.